You are here: Home / Money / Should You Keep Money Secrets from Your Spouse? Should You Keep Money Secrets from Your Spouse? 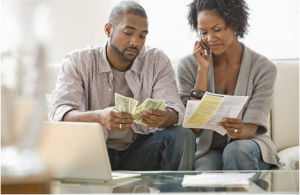 (ThyBlackMan.com) Financial infidelity or keeping money secrets from your spouse can be dangerous for your marriage. It’s true that making significant moves without informing your partner can damage the communication and trust between you two. But what if you still want to keep money secrets? Find the answer here. Financial infidelity or keeping money secrets from the spouse is a big NO according to the Bible. The Bible says that the God instructs husband and wife to be united. This unity and the concept of becoming “one flesh” according to the Genesis 2:24 NIV text means husband and wife shall become one – physically, spiritually, and of course financially. Well, since couples often think about keeping secrets, the lack of trust is the key reason in such relationships. Let’s say you’ve put some cash on your bed. If a stranger enters your bedroom, you will certainly have doubts about losing the money. But if it’s your spouse, you need to have confidence that your money will be safe. If you don’t, there are problems in your relationship and serious trust issues exist between you two. Lack of trust is common in families where there’s no room for open communication. And if that’s not the case, why would anyone need to hide money from their spouse? It’s self-explanatory if the person is planning a surprise, but if not then why do they need to keep secrets? Maybe you’re asking the same question because you are not in a condition where keeping money secrets from spouse becomes a necessity. If your spouse is too lazy to manage finance, your money secrets can actually save you from financial trouble. Everyone is different, and that’s why in some cases, it’s absolutely fine to keep money secrets. Everyone has a different personality and upbringing, so there can be many reasons why people keep money secrets from their spouse. Some people are totally clueless when it comes to managing finance. Some are less reliable in a relationship, and if this is happening in your relationship, having a secret fund might just save you. For some people, having a secret bank account or fund is actually a safety net, especially in abusive relationships. When your spouse is not someone who cares much, keeping a secret fund is important. For some people, having money in hand is the only way to keep their head held high in a relationship. Not everyone is the same. In fact, some people can’t imagine living a respectful life with their partner if they lose money or don’t have money at all. Money secrets are the only way to save yourself from tough times in such relationships. If you are a victim of abusive behavior, bad treatment, and disrespect, having a secret fund allows you to walk away. No matter whether you have to fly, drive or travel to someplace where you can feel safe, with your secret fund, you can get enough strength to stand up against abusive behavior. It can help you reach out to some friends or relatives for support. Even if the relationship is going smoothly, and everything seems perfect, there’s no harm in keeping money secrets from your spouse if you’re doing it to protect your self-respect and self-esteem. If ever your partner becomes irresponsible or unreliable, you can at least have one emergency backup. Have you tried to build the trust again? There are many ways to avoid financial infidelity, and the best one is building up trust. Expecting a life-long relationship without trust is like driving a car on flat tires. It won’t be a pleasant experience of course. If you can build up trust, there will be no need to keep money secrets from your spouse. If there’s trust between you two but you fail to manage things, learn to keep your priorities in line. You may have seen people who will justify buying an expensive phone but will avoid the doctor to save money. Then there are people who will struggle to buy grocery for the month but spend money on binge drinking on weekends. When you are living together, it’s good to spend smartly while keeping your priorities in mind. It’s should be a mutual effort otherwise it will fail. Don’t let ego ruin the beauty of your relationship. Money is not a measurement of work or success, but not everyone understands this. The less wealthy person often becomes less powerful in a relationship when ego plays its part. To avoid bad treatment, they have no other way than keeping money secrets from their spouse. In the end, it’s all about trust and mutual understanding. Keeping secrets in a relationship is not a healthy habit but if you can’t fix it, be clear and save money and don’t let it affect your relationship.